Here's where to watch every episode of Time Jam: Valerian & Laureline season 1. Mouseover or tap an episode to see where to stream it. Click or tap the play icon to stream it on the best available service. Time Matters Oct 20, 2007 In the year 2417 new space time agent Valerian embarks on his first voyage. In the year 912 he meets the irrepressible Laureline. Despite the best of intentions, they find that they have somehow changed the future and there is much to set aright. Wrong Time Wrong Place Oct 20, 2007 In the Year 2417, Earth has mysteriously disappeared and the temporal realm of Tempus Fugit is useless. No longer able to travel through time, Valerian and Laureline decide to go to Central Point , the capital of all known worlds. Once there, they find that nobody has ever heard of the Earth and they are the only representatives of mankind throughout the galaxy. In search of a clue, they meet Prince Baral , spokesman of the Confederation of Aldebaran. On the run, he is pursued by Vlagos. Valerian and Laureline , help him escape. Modern Times Oct 27, 2007 Without money, Valerian and Laureline are reduced to begging in Central Point . Three strange figures appear, they offer them a mission that will pay them enough to be able to repair the engine of the Tempus Fugit . Valerian and Laureline jump at the chance. They travel to Fulbok , a desert planet, to recover the amphora a sacred relic of a vanished civilization. Back in the ship, strange things happen. Valerian and Laureline are projected in an unreal world where past and present are the same. Till Time Do Us Part Oct 27, 2007 The Prince Baral asks for the help of Valerian and Laureline . He sends them on a mission to Bethel , a green world similar to Earth. If the planet is home to a sizable population, it could enter parliament galactic and tip the balance in favor of the Allies against the Vlagos Aldebaran. Our two heroes accept and take part in a convoy of immigrants on the planet Betel . Incognito, they fit in the group to expose the undercover agent Vlagos. This traitor aims to sabotage the operation. Time is Up Nov 3, 2007 The poverty-stricken partners are hired by three members of the strange Shingouz race to track down a “holy vase” on the planet Furbok. It turns out to be a simple task for Valerian and Laureline, but directly afterward, they're plagued by terrible relentless nightmares that are connected to the relic. Doing Time... Nov 3, 2007 The Tempus Fugit has small technical problems. Valerian is forced to land in a cemetery spacecraft to repair it. Looking for a spare part, he discovered Roger, an android on the run. The latter was built by Dr. Zessel, a mad scientist working for Vlagos. Valerian and Roger are captured and sent to the factory robots professor who took the opportunity to make a clone of Valerian. Sending it to Laureline but all does not go as planned. Time Share Nov 10, 2007 Valerian is appointed by King Gorod IV to retrieve his son, Prince Koren , heir to the throne of Antares. He finds the runaway teenager on the Archipelago of the Filibusters, a marker of bandits and thieves. Pursued by an eye cap'n and his band of pirates, they escape aboard the Tempus Fugit which is severely damaged. Valerian and Koren are forced to land on a planet lost in the depths of space. Meanwhile on Antares, Laureline discovers a plot to overthrow King Gorod IV. Time Saving Nov 17, 2007 Valerian and Laureline are hired to transport Drazel eggs to a safe haven. Easy enough, except that whoever hears a Drazel cry is doomed to laugh to death and the babies are due to hatch in 24 hours. Flying a shortcut through the dangerous Route 188 leads to an asteroid collision and the loss of precious time. Tea Time Nov 24, 2007 Mad Dr. Zessel is back with an even more heinous scheme than an android ripoff: He switches the minds of Valerian and Laureline, a disaster when they're on dates with interplanetary ambassadors. Meanwhile, Gork Yodol tries to take over the Galactic Coalition by switching his mind with its chairperson. As Time Goes By Nov 24, 2007 Valerian and Laureline find themselves on the supposedly vanished Earth, during the Western pioneer era! On Borrowed Time Dec 1, 2007 Valerian and Laureline's dream vacation turns into a nightmare. It's not bad enough that their promised luxury resort is a dump. The planet they're staying on is also swept by tornadoes and soon enough will collide with its sister planet! Time and Tide Dec 1, 2007 Valerian and Laureline are hired to locate a data cube containing the recipe for a dish so appealing that whoever cooks it for the god known as Merisarion shall be granted a wish. They do indeed find the cube, but will they even have time to cook with the Quartet of Death on their heels? A Sign of the Times Dec 8, 2007 Valerian and Laureline's relationship has hit the skids due to his recklessness, but before he can try to get back in her good graces, Laureline becomes a rising commercial star...albeit one whose strings are pulled by the sinister Vlagos. There's No Time Like the Present Dec 8, 2007 Somehow, Valerian slips into a parallel universe where Earth is intact, Laureline doesn't know him, and her father is in league with Vlagos and controlling the Galactic Council. Even in a parallel world, how could history run that course...and how can Valerian get back to his own world?! 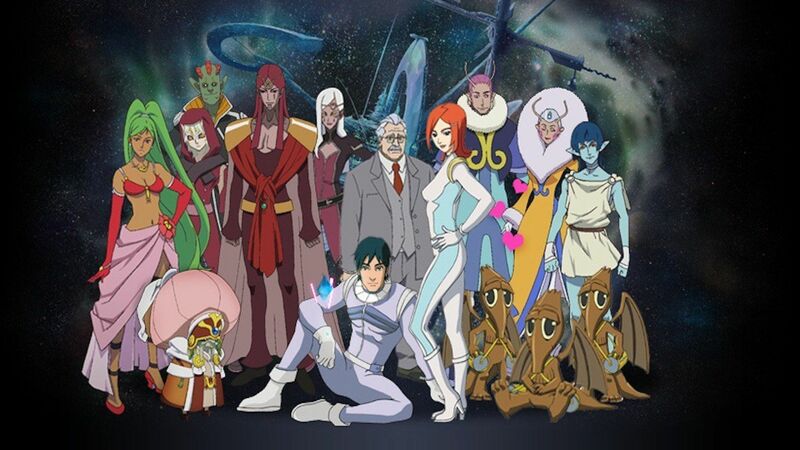 It's About Time Dec 15, 2007 Valerian and Laureline return to the solar system where Earth once was. They hear weak signals coming from the still-intact moon! After touching down, they discover a Moonbase and inside, archival footage featuring a mysterious gray-haired gentleman who offers a clue as to what happened to the Earth. Serving Time Dec 15, 2007 After Valerian foils an assassination of the Aldebaran emperor, he and Laureline track down the fleeing would-be murderer to an ice planet. But they're after no run-of-the-mill assassin. Burgas is Galactic Interpol's most wanted criminal, one who has somehow been around for 700 years! A Race Against Time Dec 22, 2007 Valerian and Laureline rescue the stranded Cyrfranu, prince of Aspara. It turns out that he's in the middle of a great space race to determine the new ruler of his planet and when our heroes hear that the villainous Gork Yodol is also a contestant, they're determined to help Cyrfranu win! Time of Troubles Dec 22, 2007 En route to a conference on energy at Central Point, Prince Baral is sidetracked by a rescue situation. Later, when he arrives, he stuns the group of reporters before him by praising Vlagos' monopoly on dirty energy. Valerian suspects something is up, perhaps a plot by Vlagos? Time to Pay the Piper Dec 29, 2007 Valerian and Laureline are hoodwinked and kidnapped at a casino, then forcibly sent to Ukbar, a gray desert planet. The only way they'll be able to get home again is by recovering the mysterious stone artifact, Ozel Ran, which contains tremendous energy. A Long Time Ago Dec 29, 2007 When Valerian and Laureline board the Legenda after a long time away, little do they know that the enigmatic gray-haired man did some “fine-tuning” to the ship. When they take her for a spin, they do a time jump to Earth, 1862, and happen to meet a young Jules Verne! Time Heals All Wounds Jan 5, 2008 Valerian and Laureline return to the rejuvenated planet Ukbar to stop a contamination of creatures...the poison-spewing Schniarfeurs that cause its victims to turn violent. Valerian will have to stop this latest scheme of Vlagos alone, as even his partner, Laureline, has become infected! Once Upon a Time Jan 5, 2008 Our two heroes are invited to the wedding of Prince Baral and Princess Pirna on Aldebar 3, but a surprise guest shows up...Alcia, Baral's former sweetheart and member of the anti-Vlagos resistance! Which is awkward, and not least because two other guests are Gork Yodol and the Grand Imperator of Vlagos! Running Out of Time Jan 9, 2008 The most popular show in the galaxy pits people against deadly creatures, but it's also illegal and there's a big reward for whoever tracks down the source of the transmission. Valerian and Laureline become contestants, but how long can even they last against the most ferocious beasts in the galaxy?! It's Showtime Jan 16, 2008 Valerian and Laureline go undercover in the wild world of 25th century filmmaking to investigate the movie studio of action movie producer Waldoun Boxoff, suspected of passing on top secret info to Vlagos. Payback Time Jan 16, 2008 Criminals Bart and Garp are caught by Valerian and Laureline, but on the way to jail, their ship is hit by a space storm. Suddenly, the whole party time jumps to Earth, the year 912, only moments before Valerian and Laureline first met! Worse, Bart and Garp escape and begin roaming the French countryside! In the Nick of Time Jan 23, 2008 While Valerian takes their ship in for repairs, Laureline journeys to Betel for the wedding of two friends. Unfortunately, Pirna disrupts the festivities by kidnapping Laureline and taking her along on a quest for a regenerative substance that Pirna will use to create an indestructible space armada! Starved for Time Jan 23, 2008 As Pirna relentlessly pursues Valerian and Laureline, the Legenda takes a hit and they're forced to make an emergency landing on an unknown planet. Pirna and her minions follow, but then the sleeping planet awakes...and it's hungry. Get With the Times Jan 30, 2008 Valerian and Laureline manage to outmaneuver Denebian space pirates, but at the cost of crash-landing on another planet. Tempers flare when they end up on a desert island, as Valerian can't get used to the utter lack of technology while Laureline, originally from the Middle Ages, feels right at home. Time is Money Jan 30, 2008 Valerian and Laureline play detectives on the planet Shingouz, where resources are so scarce, that even drinking water and breathing is taxed. Our heroes set out to discover who is stealing artwork from the galaxy's most famous museum. Time for Change Feb 6, 2008 At a market, Valerian buys a holographic star map that supposedly leads to Maya, a lost planet and home to the infinitely wise Gingiks. Valerian goes there with the skeptical Laureline in tow, unaware that they're being tailed by Gork Yodol, who wants infinite wisdom for his own purposes. Springtime in Paris Feb 6, 2008 Valerian is back in Paris, reliving episodes from his youth...but something's wrong. He's confused and has no memories of Laureline. Will he ever be able to return to her or is Valerian forever doomed to be lost in nostalgia? In Next to No Time Feb 13, 2008 Valerian and Laureline embark on a perilous mission to Vlagos in disguise in order to meet up with that world's leader of the resistance and destroy a new weapon of mass destruction that could wipe out the entire galaxy. A Matter of Time Feb 13, 2008 Alcia and her Moonbase resistance members intercept a message from Vlagos at the expense of revealing their own secret location. Pirna's attack destroys the Moonbase, but Alcia and the others successfully pass the info on to Valerian and Laureline, who set out to an unknown planet to foil Pirna's plans. A Waste of Time Feb 20, 2008 Prince Baral reveals to the Galactic Council the information that Valerian and Laureline brought back from Planet X-34, indicting Vlagos, but then a report arrives that implicates Baral himself in the murder of a Vlagosian scientist! This is the beginning of the end for the Aldebaran Empire! In Time of War Feb 20, 2008 Prince Baral turns his back on the throne to marry Alcia, but the wedding is interrupted by the attacking Vlagosian armada. Valerian, Laureline and the rest face a losing battle in space, though one of their allies, Klinch, has an idea that can turn it around. Long Time No See Feb 27, 2008 With the good guys all driven underground, there's only one thing left for Valerian and Laureline to do: jam through time, and this time, they end up in 19th century Scotland, where they encounter the enigmatic Mr. Albert, who is about to reveal just what happened to the Earth! The Test of Time Feb 27, 2008 Valerian and Laureline finally find Earth, but it's not what it used to be! Now in an otherwise uninhabited pocket of the universe, the planet is under the brutal reign of a tryant, Raymond de Tancarville, direct descendant of the man Valerian originally saved Laureline from! Only Time Will Tell Mar 5, 2008 Vlagos now rules the crowded part of the galaxy while in the backwater of Earth, Raymond de Tancarville is about to forcibly marry the captive Laureline. Can Valerian pull off a universal two-fer, saving both the partner that he loves and the galaxy that they've left behind? !